You may have read our posting of the story of Cooper and Levi reuniting here a few years ago. Well, we've had another sibling reunion at Diggity Dog Daycare. This time 2 brothers and 1 sister met up after being adopted out to separate families. 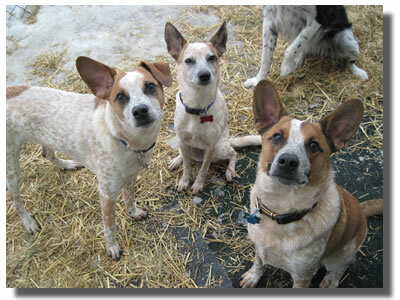 Ruby, Coby and Buddy are Jack Russell/AustralianCattle Dog mix pups about 9 months old. Ruby was the first to become a member. When Coby came in for his assessment the resemblance was striking. With a little research we found both were the same age and both got the pups from the Coulee Region Humane Society after they had come up frm Iowa. Then Coby's Mom met Buddy and his Dad at humane society gathering. Before you know it, we had all 3 here on the same day. The story was covered by the LaCrosse Tribune and was on the front page of the hometown section.